This year I was honored to serve as a teacher leader for the Missouri Teachers Academy. As a part of the leadership team, I helped to organize the monthly meetings and also to choose the year-long topic of study along with the participants. We ended up selecting a book called “Social-Emotional Learning in the Classroom” to do a book study on and apply to our classroom teaching. I have to say it was exactly the kind of book that any teacher with a few years of experience can enjoy as a good refresher course. 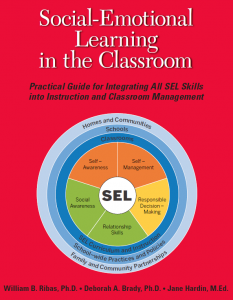 So first, what is social-emotional learning? Well, basically it means acquiring the knowledge to understand and manage emotions, set and achieve personal goals, and interact effectively with others. This is a big part of a teacher’s job beyond being content experts, because learning can’t occur unless students feel comfortable with themselves and their peers. This is probably one of the trickiest parts of teaching, in fact, because although there’s a lot of science behind it there is also a lot of art in its implementation. It’s all about anticipating student needs and behaviors before they themselves can articulate what they need. Good prediction skills like this help teachers maintain a positive class culture and smooth class flow. This is an obvious facet of being a good teacher, but yet not all teachers take it seriously. Often, teachers start out the year with this goal in mind but then forget about it as the year progresses. It’s important to develop deep and meaningful relationships with students every day in the classroom. Students need to know they can trust you and rely on you as they develop their own social and emotional skills. Teachers need to show a certain amount of openness and honesty with their students about their own personal lives in order for this to happen. Teachers are the biggest role models of positive social and emotional well-being. That’s why it’s critical that teachers demonstrate how they themselves manage their own emotions, develop a growth mindset, and follow through with goal setting. This takes intentionality during the lesson planning process, which is a skill I have had to develop since my first year teaching. Teachers should insert moments of mindfulness, opportunities for problem-solving and mistakes, as well as time for cooperative learning. This is classroom management 101, but not for the reasons most teachers would think. It’s not about being in charge, but rather it’s about helping students understand your expectations and daily schedule so that they can feel comfortable and focus on learning. This is the most important takeaway from the book and something that I am learning to incorporate more into my own teaching. Teachers often think of goal setting in terms of grades, but it’s also necessary to teach students to be reflective about their behavior and well-being. They can set goals for traits like responsibility, grit, collaboration, problem-solving, and communication. In this day and age, teachers talk a lot about soft skills required in all 21st century jobs, yet few teachers actively guide students in developing them. Understanding and implementing social-emotional learning is part of becoming a truly effective educator. It takes practice and experience to learn, but teachers can always use a refresher like this book to strengthen and improve their skills. I highly recommend it for your reading list!